Kept awake by their Snoring? This page (and Guide) is for you! Kept Awake by their Snoring? while you find yourself laying awake, listening to them and maybe wondering if they’re going to start breathing again..? Research suggests that snoring negatively affects partner’s health and wellbeing1, if they’re kept awake by their snoring partner – but how do you change this? OK they snore and its really annoying, but leaving the room isn’t fixing the problem. Are they sleepy in the day (as opposed to tired)? Do they need an afternoon nap? Over time, have they become more grumpy and irritable? Can they drive for more than an hour (or a similar boring task) without having to stop for a snooze? If someone you care about snores and exhibits these classic warning signs of obstructive sleep apnoea syndrome (check out our Jargon Buster if you’re not sure what that is) you could be really helping them (and of course yourself) by suggesting they get checked out. This really is deadly serious stuff. The suggestions below do progressively escalate your situation. So, perhaps start by discussing the situation as calmly as possible. Educate yourself so you can help them. Snoring affects you BOTH. Its not just keeping you awake while they blissfully snore away, it actually affects them as well. Studies have shown that the snoring vibrates and hardens the arteries in the throat (wiki explanation of atherosclerosis ). Sadly, we hear all the time that partners just give up and go and sleep in the spare room or on the sofa. This isn’t a solution! And it can spell the end for a relationship. Alternatively, consider ways in which you could hint or suggest they learn more about the impact of their snoring upon themselves. You could try encouraging them to change sleep position. Some people snore more loudly (or only) when they sleep on their back (known as supine related). Google ‘sleep positional therapy’ to learn more. If all the above fails, then you could try recording the snoring noise and playing it back to them. This is really confronting the snorer with their own snoring – it could get messy! Some smartphones have a voice record capability. Turn down the screen brightness to its very minimum – or it may seem like a torch in the snorer’s face! Good luck! Helping them to stop snoring could not only improve your own sleep, but may actually prolong their life and improve the quality of that life, especially if they have undiagnosed sleep apnoea. Read our FREE Partners Guide available on our Information Guides page. 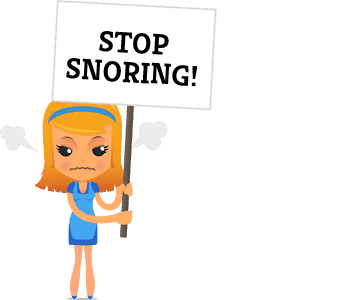 Please do not encourage your partner to self-diagnose themselves (“Oh its just snoring”) and buy an Over-the-Counter (OTC) anti-snoring device. Here’s why: these things do more harm than good.